The garden furniture picnic table set TUSNAD 1 made of metal and wooden slats. The garden table set is designed for parks, recreation areas and playgrounds and other place for relaxation. The garden table set is composed from one table and two benches. The metal parts of the furniture set are powder coated. The coating is applied electrostatically and is then cured under heat. It is used to create a hard finish that is tougher than conventional paint, which gives the benches and table a higher resistance over time. The wood slats are standard made from softwood (spruce, fir). Softwoods are not necessarily softer than hardwoods. It's a resistant material for outdoor environment. Please refer to our Regular Color Chart for Wood - take into account that is made on softwood support. On special orders other colors can be made - Special Color Chart for Wood. Softwood elements of the benches and table is treated with three layers of protection against moisture, insects and ultraviolet light. Delivery term: between 1 and 3 weeks from valid order. This term depends on stock, production and transport availability. 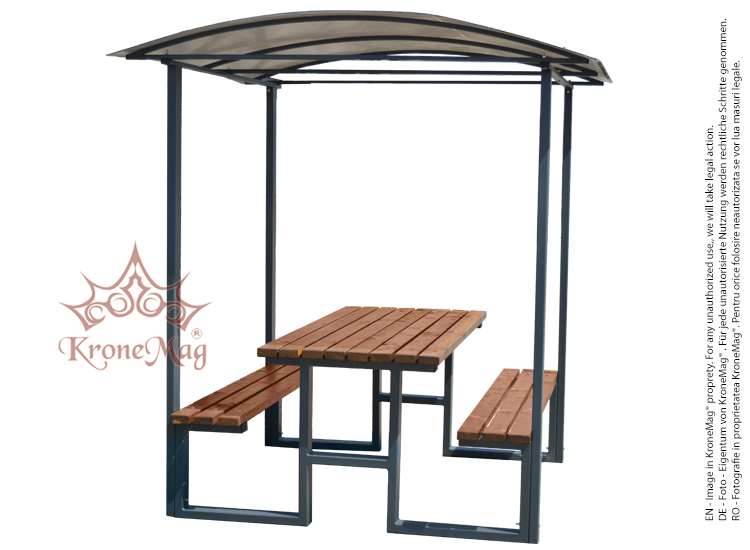 Street Furniture Picnic Set TUSNAD-ORThe street furniture picnic table set TUSNAD-OR made of metal ..
Street Furniture Picnic Set BRATISLAVA-ORThe street furniture picnic table set BRATISLAVA-..
Picnic table, benches, park furniture STUTTGART-ORThe STUTTGART-OR picnic set is made of galvanized .. The Outdoor Park Seat Bench THAVIS.B is made of metal and wood elements.This park seat bench is.. The outdoor Park Bench THAVIS-OR is made of metal legs and wood slats.This park bench is a..